Tan Sri Rafidah binti Jubur Aziz is widely regarded as one of the strongest Malaysian woman today. She is an active politician who is the Member of Parliament of Kuala Kangsar and has been serving the constituency since 1986. Kuala Kangsar in Perak is the place where Rafidah was born and she was most prominent when she was the Minister of International Trade and Industry where she held the ministerial post from 1987 to 2008 which earned her the title ‘Iron Lady of Malaysia’. As a Minister, Rafidah was known for her hard and strict ways in managing her team and staff. It was said that she was like a discipline master of a school and that there would be consequences if her instructions are not followed. Rafidah was also the former Wanita chief of Umno before she lost to the current chief Datuk Seri Shahrizat Abdul Jalil in 2009 which pretty signified her move away from active politics. Rafidah was accused of corruption in 2006 in issuance of the AP (Approve Permits) issue for the import of foreign vehicles into Malaysia, allegations which she had denied ever since. The former prime minister Tun Dr Mahathir Mohamad, of whom Rafidah said to treat like ‘her father’ even criticized the government for retaining her as the Minister then. It seems that it was already written then when Rafidah was dropped from the cabinet by the then prime minister Tun Abdullah Ahmad Badawi 2 years later where she now holds only the MP post. 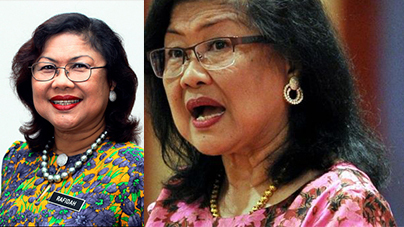 Despite the accusations which were neither validated or verified, Rafidah remains as one of the most prominent leaders of Malaysia for her ability to have a loud and strong voice for women in the administration which are predominantly men and to date, there has not been any women politician who could exude such confidence and strength from either side of the political divide.